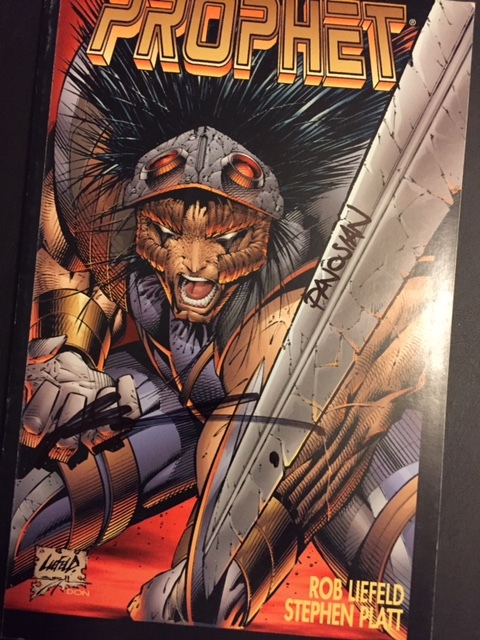 One of the terrific and unexpected buys from Big Red Comics' Extreme 25th Anniversary signing was a vintage copy of Rob Liefeld's "immortal warrior traveling through time" Prophet, collecting the first 7 issues of 1994's visual and violent series. 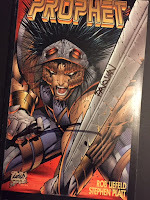 Liefeld created and wrote the series with Dan Panosian handling art for the first 4 issues and Stephen Platt coming in for number 5. 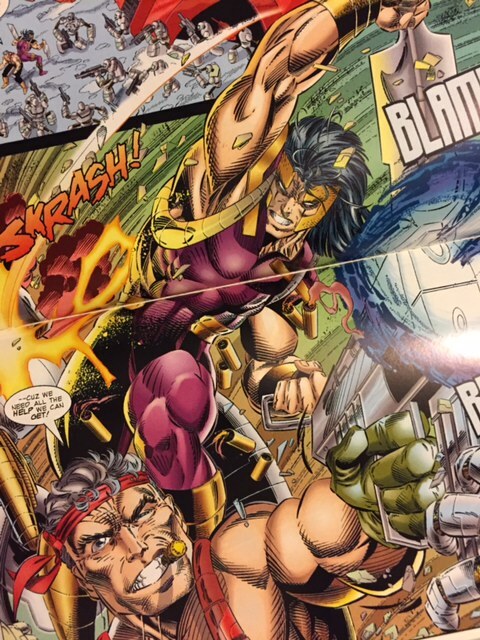 I had recently picked up a remastered Youngblood hardcover where John Prophet, a former homeless man turned into a super soldier that goes into suspended animation, wakes up in the modern age with a passion for God, wielding two swords, purple tights and headgear you're not sure the purpose of. Now starring in his own series, we catch up with Prophet and his little gun toting, doesn't wear a shirt but has shoulder holster straps everywhere, Kirby, as they try to reestablish contact with D.O.C.C. (Direct Orbiting Command Center). Somehow the source of Prophet's info and power, while lots of government types want to get Prophet under their control. There's a lot of violent nightmares and flashbacks along with ol' John constantly quoting the bible. You get a run in/crossover with Bloodstrike and peeps from Prophet's past thought long dead. Dan Panosian's art is pretty clean with muscles galore along with two page action spreads aplenty. 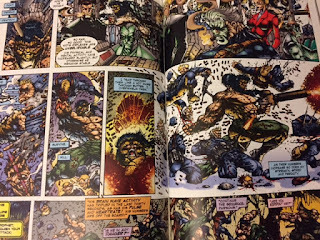 But things get knocked up a notch when Stephen Platt takes over with much more mayhem (guys get machine gunned in half) and little details like shell casings or lots of little sinewy lines EVERYWHERE. Platt's work is quite grand in scope and the era's abundance of ear antennae, shoulder pads and giant guns never looked better. The series would go on for another 4 issues before being relaunched several times through today. It was recently revealed that Liefeld bought Platt a car to lure him from Marvel's Moon Knight and paid him $40,000 an issue. 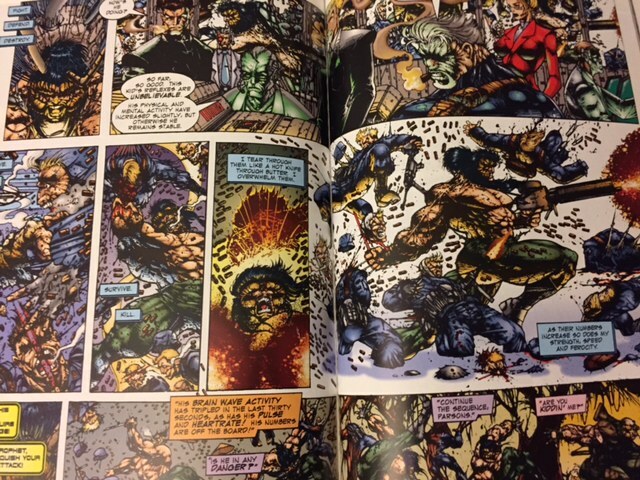 But deadlines were always missed with Platt giving everything he had making for dynamic pages if not a release schedule you could set a clock to. Years on, Platt distances himself from Liefeld while the Rob has no issue explaining that it was entirely the artist's fault.